Hey Hey It’s Saturday host Daryl Somers (pictured with Logies guest Raquel Welch) was awarded the Gold Logie for Most Popular Personality on Australian TV at the 31st annual TV Week Logie Awards, held at Melbourne’s Hyatt On Collins on Friday, 17 March 1989. After Norman Gunston (Garry McDonald) presided over the (brief compared to these days) red carpet interviews, the Logies kicked off with a performance by six former Gold Logie winners — dubbed the Golden Girls — Lorrae Desmond, Hazel Phillips, Pat McDonald, Denise Drysdale, Jeanne Little and Rowena Wallace. 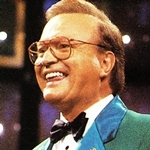 The “red hot mommas” then introduced to the stage Bert Newton (pictured) as MC — his first Logies hosting since 1984. Hosting the Logies was Newton’s first on-air role since joining the Seven Network. His next challenge was taking on daytime TV king Ray Martin in the midday timeslot, starting the following Monday. Newton and Martin shared a light-hearted moment on the Logies stage ahead of the upcoming midday battle. 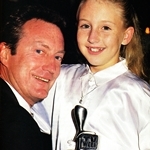 For Somers it was his third Gold — having previously won in 1983 and 1986 — but before the night he thought his Gold Logie winning days were over. 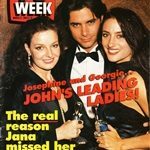 “The way TV has been going demographically I thought I was out of the race,” he said, a comment reflected by the fact that his three fellow nominees — Kylie Minogue, Craig McLachlan and Jason Donovan — were all young soapie actors, and that their series, Neighbours, was at a ratings high. But despite missing out on a Gold Logie win, Neighbours still came away with four Logies — Most Popular Series, Most Popular Program In Victoria, Craig McLachlan for Most Popular Actor and Annie Jones for Most Popular Actress. Network Ten’s other big ratings hit, The Comedy Company (pictured), scored two Logies — Most Popular Light Entertainment/Comedy Program and Maryanne Fahey winning Most Popular Light Entertainment/Comedy Personality. Brisbane-based children’s program Wombat collected two Logies — Most Popular Children’s Program as well as Most Popular Program In Queensland. Current affairs program Four Corners won the Most Outstanding Achievement In Public Affairs. The award wasn’t recognition for any specific report but rather for consistent excellence through the year — including Peter Couchman‘s report on the involvement of Australian criminals in prostitution and drug rackets in Manila, Paul Barry‘s report on the mounting death toll from cancer at the Wittenoom asbestos mine in Western Australia, Tony Jones reporting on Chinese Triads moving into prostitution, drug and gambling rackets in Australia, and Chris Masters‘ visit to Gallipoli for an Anzac Day special. National Nine News reporter Michael Venus was awarded Most Outstanding Achievement In News for his reporting on the events surrounding the tragic deaths of police constables John Tynan and Damian Eyre. The two officers were killed when attending to a routine call in the Melbourne suburb of South Yarra on an early morning in October 1988. In awarding the Logie to Venus, judges also made special mention of reports on the Seoul students’ riot (Nick McCallum, ATV10), Australia Day (TCN9) and Robert Penfold‘s (TCN9) report of violence breaking out at a Belfast funeral. ABC‘s six-part documentary series Nature Of Australia collected the Logie for Most Outstanding Single Documentary Or Series. The series, three years in the making, was regarded as the first comprehensive television account of how the island continent and its unique plant and animal life came to be. The series also received acclaim at the Wildscreen festival in the United Kingdom. Rockhampton television station RTQ7 was awarded Most Outstanding Contribution By Regional Television for its series of Walkabout documentaries. The six programs were aimed to bring central and northern Queensland to the rest of Australia during the bicentennial year. Overseas guests at the 31st annual TV Week Logie Awards were Raquel Welch and actor Leslie Nielsen. 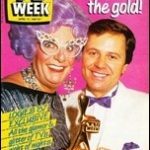 The 56th annual TV Week Logie Awards. Sunday 27 April, 8pm (Red Carpet 7.30pm), Nine Network.